The Holidays are just around the corner! 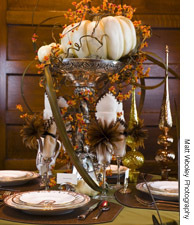 Why not freshen up the interior of your home or office for entertaining? A one-hour consultation with Deborah will do the trick! Sometimes a minor addition to old decorations can make them look brand new. 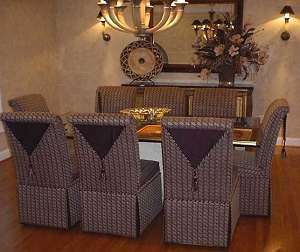 By moving existing furniture around, rearranging bookshelves, and hanging art in different places Deborah can dramatically change the appearance of your home or office space. Don't delay! Call 859-269-7711 today to schedule your one-hour consultation. Do you need an updated look for your business? Do you need to invest in your office before the December 31st tax deadline? 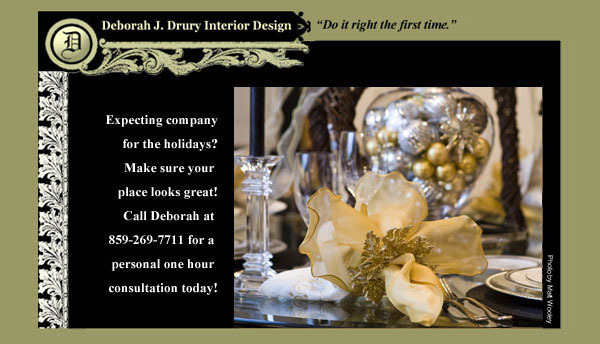 Whether your design needs are for residential, commercial, special event or even nautical interior design services, Deborah saves you money by doing it right the first time. To find out more, visit www.ddruryid.com today. an elegant Christmas table, and fireplace mantle design. What do you think of the newsletter? Please send your feedback! If you have any future topics you would like discussed please e-mail Deborah at ddruryid@aol.com. . . . . . . . . . . . . . . . . . . . . . . . . . . . . . . Please feel free to forward this e-newsletter to friends who might be interested in decorating for the holidays. Copyright (C) 2008 Deborah Drury Interior Design. All rights reserved.